are simply too many notes, that’s all. 1. Your own list, as short or as long as you wish, of your favorite movies. 2. You are also invited — though not required — to include a quote that you find memorable from one or more of them (or not). 3. You are welcome to send comments like “How could you possibly leave out ________ from your list?” or “How could you include a dumb movie like _________ ?” All are welcome. —> A few words of caution — I intended to make a list of ten movies. BUT, that turned out to be impossible. A struggle with painful cutting brought it down from 25 to 17. So, if you decide to make your own list, all of your good intentions to keep it short may be futile. I also could not list them in order of “favoriteness.” Just couldn’t. So, they are in alphabetical order. I also ignored the winners of the most recent Academy Awards, since I wasn’t familiar with many of them anyway. I also did not consider whether “my” movies received any awards in their day. I hope you, at least, find this exercise interesting. • John & Ray Kinsella: “Is this heaven?” “It’s Iowa.” “I could’ve sworn it was heaven. Oh yeah, it’s the place where dreams come true. [Looks around and sees his wife playing with their daughter] “Maybe this is heaven. 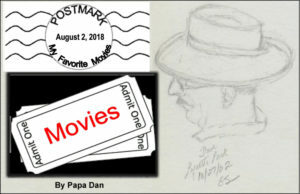 • “Earn this.” At the very end of the movie, Tom Hanks says it twice — once to Private Ryan and once to all of us in the audience who have benefitted from the sacrifices of soldiers in World War II. I omitted a category of “ancient” movies (like Casablanca and those starring Marlon Brando-types), movies by Alfred Hitchcock (although I enjoyed several of them, notably The Birds and Rear Window), and most “war” movies (notably Patton). I also left out The Ten Commandments (I was ten years old when my parents took me to the drive-in to see it), and Ben-Hur (I was nine when my parents took me to its Premier in Oakland), Raiders of the Lost Ark (not sure why), Schindler’s List (because I don’t like remembering it), and Blazing Saddles (because all the memorable quotes are racist and disgusting). It’s funny about movies. Looking back, some of the choices of “favorites” can feel quite personal and can represent who we were back when we saw them. But, they’re just movies, right? I look forward to your comments, maybe even a few lists. — In no particular order (another excellent list!). Thursday, August 2nd, 2018, by Daniel and is filed under "Ideas, Who We Are ". You can leave a response here, or send a Trackback from your own site. My favorite movie of all time is a sleeper called Country Featuring Jessica Lange and Sam Shepard. Top of my list are (1) King of Hearts and (2) Hardware Wars. (I thought about adding Bambi Meets Godzilla but…) This list is notable in that I saw all three movies the same night in a triple feature! Jeannette, thanks for your excellent list. As usual, you have reminded me of a “favorite” of mine that I left out of my list: “Fiddler On the Roof” thank you. Lauren, You’ve identified a gap in my education. I haven’t see any of the three you mention. Also I don’t think I’ve ever seen a triple feature before. Where’ve I been? A few years ago on Facebook, three of us did our 50 favorite films. I’ll borrow from that list, and add a recent movie that I’d include if we did it all over again. Dan, Yes, I forgot about “Wait Until Dark.” Another great one. Oh, yes, I forgot about “The Wild Bunch.” Thanks for your list. Here is my list of favorite movies, in no particular order. It would be easy to keep going, but I stopped at a dozen. Janet, Thanks for your list. Once again, your list reminds me of another favorite of mine — how could I have left out A Christmas Story? !